R + D on additives. 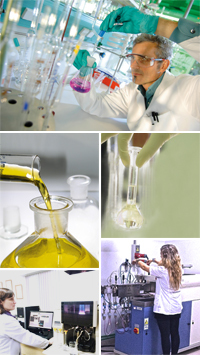 Quality Control on raw materials, intermediate products and finished products. Customer service in terms of technical applications and analytical support. Aid in selecting and using the most effective additives, follow-up during set-up and scaling-up. Availability to help in technical and analytical testing. Set-up of training courses about specific technical questions and staff training on the use of Lab equipment concerning analyses and applications. Innovation, creativity and constant adjustment to the rules and regulations which govern the launch of our products on the market are the fundamentals underlying our cutting-edge position.